Rediscover classic recipes or try something new and exciting. Whatever the mood, there’s a Koloa Rum that will bring a welcome depth and smoothness to your cocktails. Please feel free to substitute our award-winning Hawaiian rum with any of these recipes that we have collected. Combine ingredients in a cocktail shaker. Pour into Collins glass. Top with 4–6 oz. Club Soda. Garnish with an orchid. Fill a highball glass with ice and spirits. Top with juice. Grind nuts in a food processor on low. Refrigerate. Put all ingredients in a mug. Add 5 oz. of hot water. Garnish with whipped cream, nutmeg and cinnamon. Muddle the basil and pineapple chunks in a cocktail shaker. Add juices and rum. Shake and strain over ice into a hurricane glass. Garnish with a sugar cane stick. Muddle ingredients together. Add ice to fill glass. Fill a glass with ice. Combine first three ingredients, float dark rum on top. Garnish with a pineapple slice, maraschino cherry and paper umbrella. Fill a highball glass with ice. Pour ingredients into glass and enjoy. Combine ingredients in a cocktail shaker with ice. Shake well. 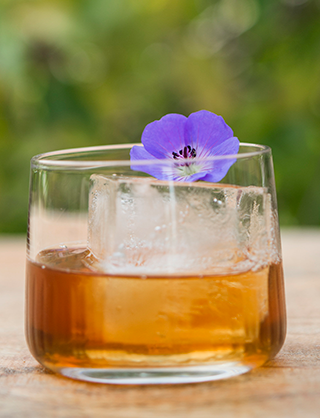 Strain into a suitable glass with ice cubes. Garnish with a tropical flower and pineapple leaves. Lavender Simple Syrup: Boil 1 cup of water and add 3 tbsp. lavender blossoms. Stir in 2 cups of sugar and dissolve. Allow mixture to cool and strain. Combine ingredients in a cocktail shaker with ice. Shake well. Strain into a coupe or martini glass. Pour ingredients over ice in an Old Fashioned glass. Top with half and half. Combine ingredients in a cocktail shaker. Shake well. 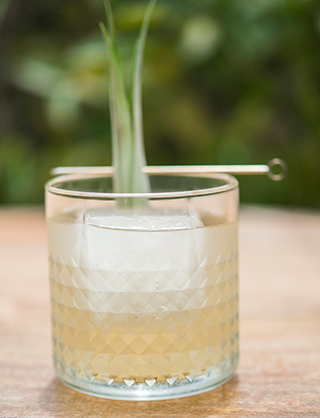 Pour into a highball glass and add a float of Koloa Dark Rum. Garnish with lime wedge and pineapple. Combine ingredients in a cocktail shaker. Pour over ice into a suitable glass. Muddle cucumber, strawberry & honey syrup. Add the remaining ingredients to the pint glass, less the soda, and shake. Add the soda water, then strain into a rocks glass over ice. Garnish with cucumber. Muddle ginger, lemon and simple syrup. 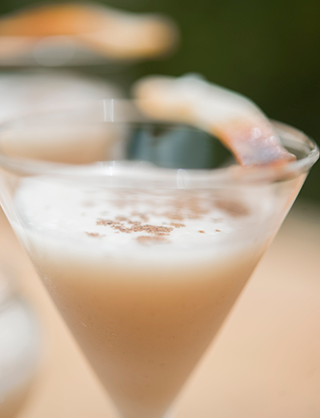 Add the spiced Koloa Rum to the pint glass and shake. Add the pineapple hard cider, then strain into a rocks glass over ginger ale ice. Garnish with a pineapple leaf. Ginger ale ice: freeze ginger ale into king ice cube molds. Smoke cocktail glass. Add all ingredients to shaker; shake. Strain into smoked rocks glass over large ice cube. Squeeze orange zest over cocktail, discard. Garnish with flower. Add all ingredients to pint glass; shake. Strain into small glass and garnish with a pinch of vanilla bean powder and a chocolate covered espresso bean. Add all ingredients to pint glass; shake. Strain into a rocks glass over fresh ice. 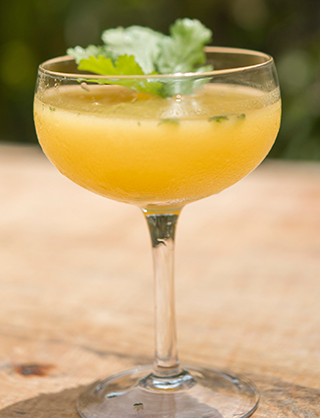 Garnish with cilantro leaf.